Mix the mango in a bowl with the tomato, onion, garlic, pepper, lemon juice and tomato sauce. Cook for 10 minutes; softly stir occasionally to prevent damaging the ingredients. Remove from the heat and stir again then add the chopped cilantro. Let cool and serve over the salmon. Preheat the grill. Season the salmon with salt and pepper. Moisten the grill with a bit of oil using a kitchen brush. Place the fish on the grill and cook for 6 to 8 minutes on each side until the fish is cooked. Do not overcook. If you want, add paprika to the fish before you cook. You can use chicken instead of salmon. Summer is almost here and for many this is the season to turn on the grill to spend more time enjoying the outdoors. I suggest taking advantage of these warm days with this mango salsa to serve with any fish. 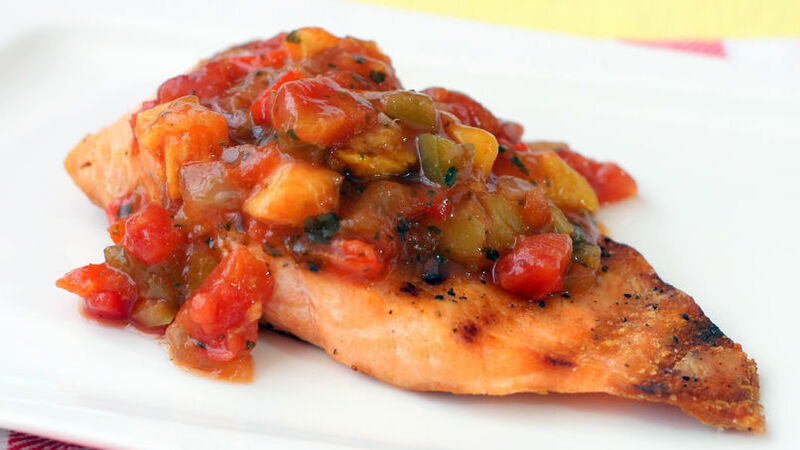 This time we'll be preparing a tasty salmon, but you can also prepare this sauce with grilled chicken.